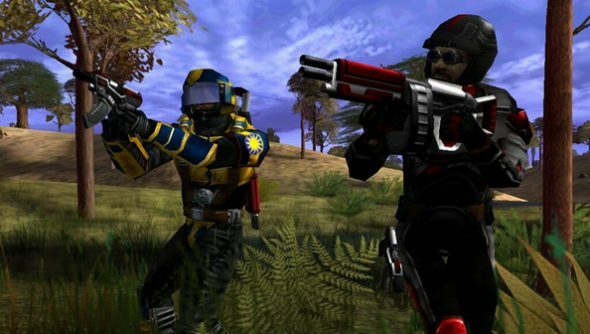 Since the announcement of Planetside 2 – then entitled Planetside Next; it’s nice to live in the future – SOE have kept relatively schtum on plans for the original Planetside. Yet the endless war goes on, its three factions slugging away at each other for all eternity until somebody turns out the lights. But nobody is going to be turning out the lights on Auraxis MK1 any time soon, says SOE head John Smedley. Instead, Planetside 1 is going free to play. When asked on Twitter, Smedley said there was “nothing to announce about Planetside 1 at SOE Live”, the Vegas extravaganza due to start tomorrow. Concerned about the form a free-to-play Planetside might take? Don’t be. Smedley has waxed complimentary recently about the payment model of League of Legends, the MOBA with the most inoffensive and respectful free-to-play system to date. Would you play a free Planetside? Or is the 2003 original past its server-shutdown date?